Ooh, this book is amazing. 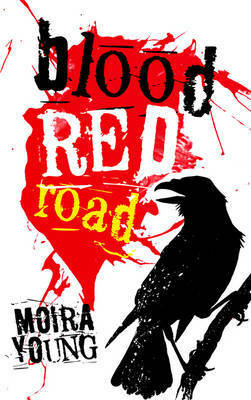 I thought I'd probably like Blood Red Road by Moira Young but I had no idea that I would *love* it as much as I did! It's an absolutely addictive read filled with amazing and complex characters, a twisty and adventurous plot and a love story that made me melt! I really, truly loved this book! You've got to give Moira Young props for writing the story in dialect - I don't think that's easy to do and the poor spelling and lack of grammar could well put some readers off. Personally, I loved it and the way in which our main character, Saba, tells her her own story using that dialect felt just right. I also loved the world-building that occurs - like I could close my eyes and BE in this same world with Saba and Emmi and Jack. Blood Red Road is set in a future world where things are hard and life is pretty cheap - people die or taken for slaves or cage-fighting without so much as a blink of an eye. Saba and her twin brother Lugh live with their father and younger sister, Emmi in a wasteland away from other people. Times are tough - especially when mysterious riders come through and kill Saba's father and kidnap Lugh. Both actions cause Saba to embrace her inner red rage and vow to rescue Lugh and avenge the destruction of her home and family. She sets off this hugely exciting and dangerous journey where she meets some rather bizarre characters and must get herself out of some nasty scrapes. Never quite sure who to trust, Saba is pushed to her very limits in order to fulfill her goal. I love Saba. What a fabulously strong, strong-willed character. She's tough and a little intimidating but you can see her soft side too as Saba consistently puts herself in harm's way in order to protect the people she cares about. But she sure isn't perfect. She tries to do things on her own all the time, she pretty much hates her little sister and treats the poor girl horrendously. Saba's all-consuming in her obsession with getting Lugh back that isn't able to see that those around her support her and are loyal to her. It was really great to witness Saba's the massive change in Saba's character from the beginning of the book to the end. And oh my god, Jack. Cocky and arrogant, I absolutely swooned at the first mention of him! His relationship with Saba just got more and more steamy and I cannot wait for more page time with Saba and Jack. Or any of these characters, really. And in the world. More, Moira Young, more! Man, I loved this when I read it last week! Jack is definitely swoonworthy and I hope we get to see a lot more of him in book two. I'm completely and utterly sold :D Great review. Sophie - I really, really love this book too :) And Jack, of course. Jenni - Oh, definitely do read it! It's woooonderful. Jules - Yes. Try it! I hope you are as swept away by it as I was. Fab review! I really want to read this one as I keep hearing amazing things about it. SJH - Do it, do it, do it! It's a FAB book. Raimy - YES! Do read it, I LOVED it. Sounds really intriguing - plus I'm waiting to read a good romance! Your review puts me in mind of Mad Max! Thanks, I'll keep my eye out for this one. Wow, that is a cover change! I recently read this book and my cover was very different. I am looking forward to the second book. Kailana - It can be really interesting, the differences in covers in different countries! Which do you prefer? Yours or this one? I LOVED this book too! Saba, Jack, Emmi, the Free Hawks, the Coliseum, everything!! I can't believe we have to wait until next year for the sequel! Alyssa - I KNOW! I loved this book SO MUCH.